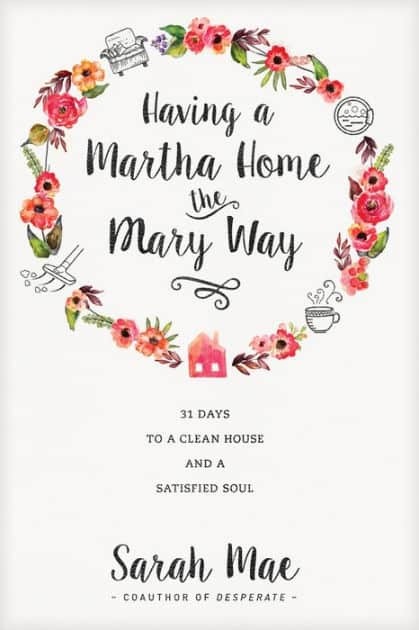 Over the next few weeks we’ll be going through the book, Having a Martha Home the Mary Way: 31 Days to a Clean House and a Satisfied Soul by Sarah Mae. Once the study begins, you’ll be receiving emails from me each morning. We will read the days lesson and complete the Martha Challenge and the Mary Challenge for each day together! Go ahead and purchase the book. We all know the dream: a clean, beautiful home where everything has its perfect place, where guests can feel relaxed and restored, and where we feel a sense of rest. But we all know the reality: many days it just doesn’t happen, especially if you’re a mom with little ones! When the mess and chaos of everyday life hits, is it possible to create a life-giving home filled with serenity? Sarah Mae wants to let you in on a little secret about being a homemaker: it’s not about having a clean house. She’d never claim to be naturally organized cleaner herself, but she’s found it’s possible to find peace through the art of gentle homemaking – you can care for your heart and your home at the same time. Journey with Sarah Mae on this 31-day plan to get your house looking and feeling fresh. But even more, you’ll gain a new vision for the home of your dreams, one that centers on what really matters: loving others. 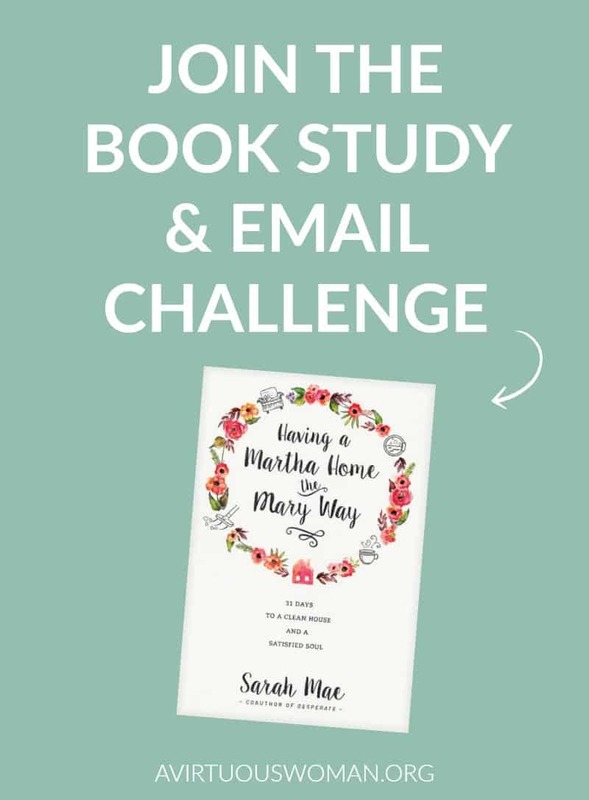 Originally published as the e-book 31 Days to Clean and now revised and expanded in print, Having a Martha Home the Mary Way will inspire you to find a happier, healthier… cleaner way to live. You’ll receive all of the posts in your email box. This is important because this challenge is exclusive to those who sign up – you won’t find these posts anywhere on the blog! You may also want to join my exclusive Facebook group, The Ministry of Homemaking, where you canl discuss the challenge more. 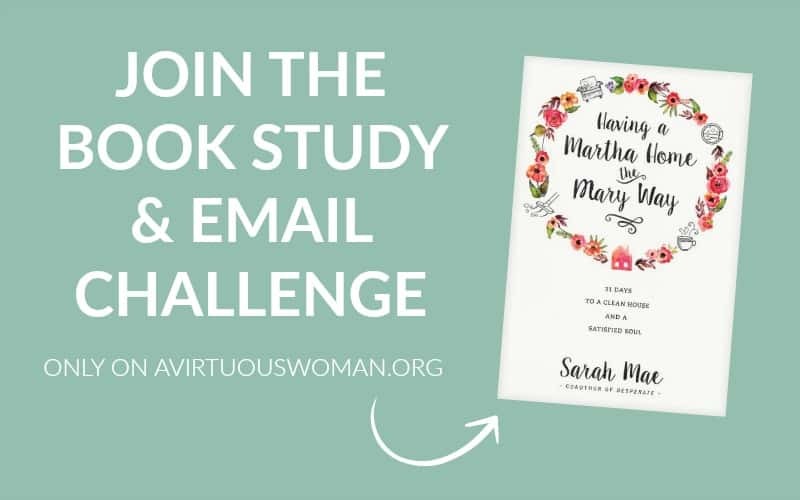 I’d love to have you share this challenge with all of your friends, on Facebook, Pinterest, on your blog – every where! Thanks so much! To join the challenge you need to sign up using the form below. It’s easy! I’ll send you instructions right to your email box. Be sure to add me to your address book so the emails don’t go to your spam folder. Yay. I am very excited about this study. I am off to buy the book now. I'm so excited too! Glad you're joining me! Yay! Glad you're joining in! Just ordered the book through your link. I am so excited for this! When I was in my 20's I kept and immaculate house with two under 3. Now, fifteen years later, I can hardly keep up even with the kid's help. Thank you, Melissa.